It's easy to save and store cucumber seeds for next year's garden and beyond. When properly saved and stored, cucumber seeds can last between five to ten years. Once you've saved your own, you won't ever need to buy seeds. 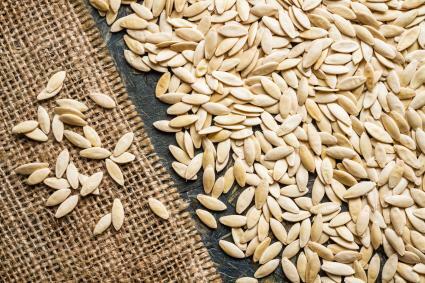 If you're going to save seeds, you'll want only seeds from the original plant. This means you need to grow only one variety of cucumber so there's no danger of cross-pollination. This precaution will ensure you harvest seeds from the parent plant only. Seeds from hybrid plants are unreliable. You never know what you'll end up growing. Saved seeds from hybrid plants are often sterile and of no value. If you're going to save cucumber seeds, you need to plant an open-pollinated (bred pure) variety. Heirloom seeds are handed down from one generation to another and must be open-pollinated to ensure the modern seed is nearly identical to the original parent plant. This is what gives heirlooms their value. Not all open-pollinated plants are heirlooms. When purchasing heirloom plants or seeds, the description will state it is an heirloom. You want to select the healthiest cucumber plant for harvesting seeds. A plant that is struggling or producing malformed cucumbers isn't a good candidate for seed harvesting. Instead, look for the plant excelling in production and quality of cucumbers. Don't wait until the end of the season when plants are at their lowest energy production. 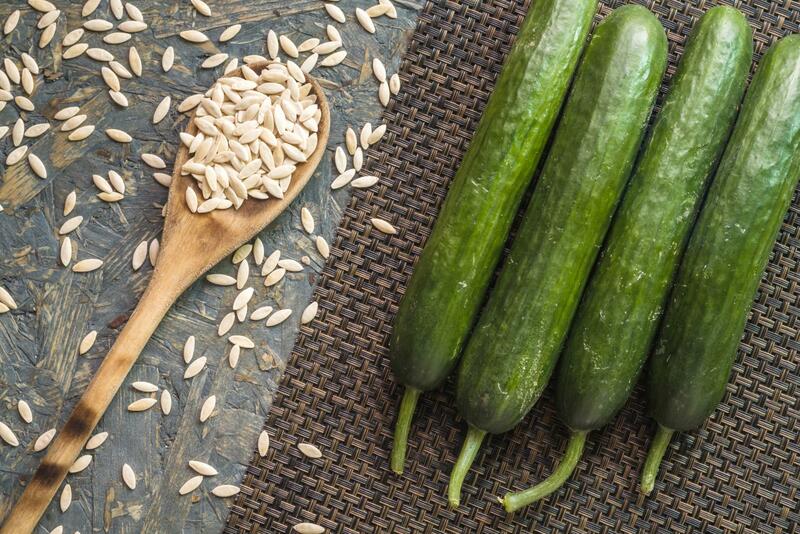 You should select the best cucumbers for seed saving. Choose the cucumber that is the healthiest and let it remain on the vine long past the harvesting time. 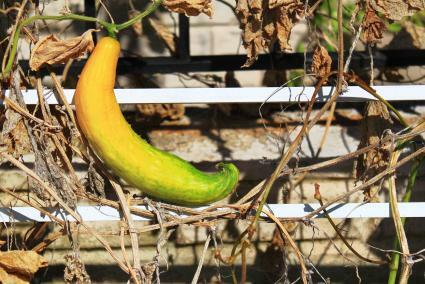 Allow the cucumber to turn yellow (some varieties turn orange) and the peel to become soft. Harvest the cucumber from the vine. It should release from the vine very easily. You want to harvest the seeds from the over-ripened cucumber as soon as you pick it. Slice the cucumber lengthwise and scoop out the seeds. 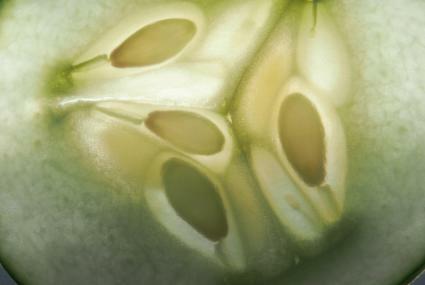 You'll notice that the seeds are encased in a gel-like substance. This gel sac needs to be fermented so it falls away from the seed. The fermentation process of the seeds serves two purposes. The first is to get rid of the gel sack so the seeds can dry out. The second purpose is to kill any diseases or viruses the seeds might harbor. Place the seeds in a glass jar or bowl and cover with just enough warm water so the seeds float (they will eventually sink to the bottom). Leave the seeds soaking for three to four days. Keep seeds out of sunlight. The bad seeds will float to the top of the water along with any pulp. These can be discarded. The good seeds will sink to the bottom of the jar or bowl. Skim the bad seeds and pulp from the surface and discard. Strain the good seeds through a mesh sieve and gently rinse them to ensure all the gel sac is gone. 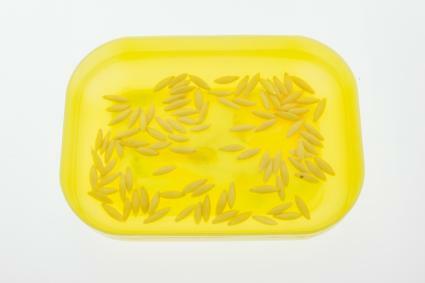 You want to allow the seeds to dry completely before storing. Spread the seeds out on a piece of paper towel or parchment paper. Leave undisturbed for four days or longer if needed. Don't place seeds in sunlight. Once the seeds are thoroughly dry, transfer them into a seed envelope/sleeve or a small glass jar. Label with the cucumber variety and date stored. Place the seed envelope sleeve or jar in the freezer for a couple of days to ensure any possible pests or disease that resisted the fermentation process are removed. Remove the seeds from the freezer and store in a cool dry, dark place. Some people store their seeds in a refrigerator. You can store them in a drawer, cabinet, or plastic container. Cucumbers are self-pollinating. This means that the male and female flowers grow on the same vine and don't require other plants for pollination. Cucumbers can self-seed. Just allow the cucumber to remain on the vine and fall to the ground. Next season, you'll have volunteer cucumber plants. If you pick a nice healthy ripe cucumber to eat but later decide you wish to save its seeds, set the cucumber in a cool dry place to continue ripening. Allow it to turn yellow or orange and soft and then harvest the seeds the same way you would if left on the vine to mature. Next season, plant your saved seeds one inch deep. For vertical vines, plant seeds one foot apart. Ground vines should be planted about three feet apart.